The Patriots started the on-field portion of their Organized Team Activities on Monday, but did so without Tom Brady, as Adam Schefter of ESPN.com tweets. While OTAs are voluntary, Brady’s absence could be a sign of friction in New England. Brady’s decision to stay away could mean the two sides are still far apart in talks to re-work his contract. Brady, who has been playing under a below-market deal for years, is currently signed through the 2019 campaign. In each of the next two years, he’s scheduled to earn a base salary of $15MM, while $7MM of annually prorated signing bonus money will bring his cap charges to $22MM in each season. The 40-year-old has no intentions of retiring anytime soon, so he is seeking a deal that will take him into 2020 and beyond. 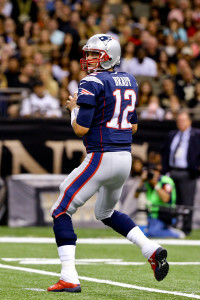 Brady has indicated that he is staying away from the team, in part, to spend more time with his family. While OTAs are voluntary, the June mandatory minicamp is not (as the name suggests). With that in mind, the real situation to watch will be next month when the team gets to work on June 5-7. Come on Pats. Brady all the years he wants. He was last year’s MVP, no signs of regression, and there is no successor. Give Brady a nice 3-year deal and let his personal trainer back in the locker room. Brady can do whatever he wants. He’s a spoiled old brat. Kraft will never give him what he wants money wise. Brady is just there puppet.